In the contest for ultra-high fuel efficiency, France is coming up with a seriously tough lineup of concepts. 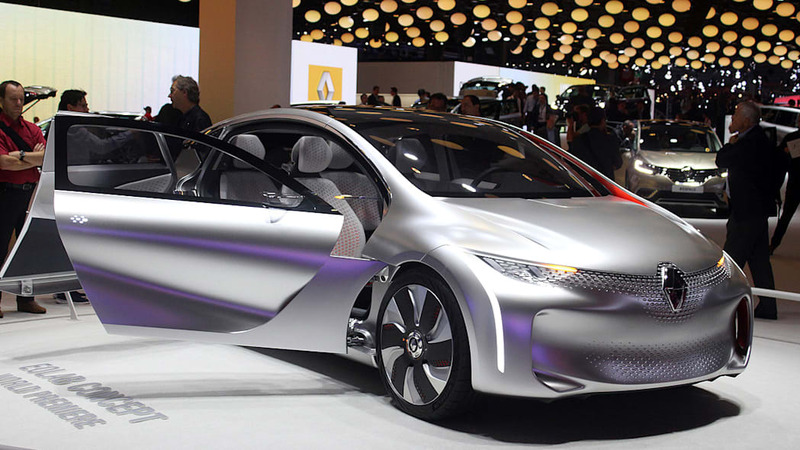 Both Peugeot and Citroën have concept cars on display at the 2014 Paris Motor Show that blend aerodynamics, low curb weights and cutting edge powertrain technologies to return 141 miles per gallon on the European cycle. And now Renault has just unveiled its fuel-saver to the world's press, showing off the Eolab, a concept hatch that promises to use only one liter of fuel for every 100 kilometers traveled. For the math averse, that works out to about 282 miles per gallon, or a lot. Like the PSA concepts, a low curb weight is key to the Eolab's efficiency. With an overall weight at just about 2,100 pounds, the gas-electric hybrid powertrain, which can run up to 37 miles on electric power alone, isn't forced to work too hard. While PSA based its concepts on actual production models – the Peugeot 208 and Citroën C4 Cactus – the Eolab is more of a pure concept. According to Renault, it employs "100 new, realistic technological developments" that could make their way onto French roads. Take a look up top for our live images from the 2014 Paris Motor Show. Then, scroll down for a video and stock images of the Eolab, as well as a 13,000-word press release, direct from Renault. EOLAB, which takes its name from combining the name of 'Aeolous' God and Ruler of the Winds in Greek mythology, and 'Laboratory', is capable of achieving 1l/100km (282mpg) and 22g/km CO2 emissions on the official NEDC cycle. To achieve such low figures, the designers focused their efforts on three main areas: minimising weight, refining aerodynamics and using "Z.E. Hybrid" technology for all, a brand new initiative which permits zero emissions* motoring during everyday use. For Renault, the purpose of EOLAB is to remain true to the company's DNA by ensuring that ultra-low fuel consumption becomes a reality for as many people as possible. This in turn means making its technologies available at a price that people can afford. EOLAB features materials such as magnesium and aluminium, which are extremely light and also much cheaper than titanium. Meanwhile, the notion of such a car being produced in large numbers within the next 10 years was dialled into the plan from the very start. 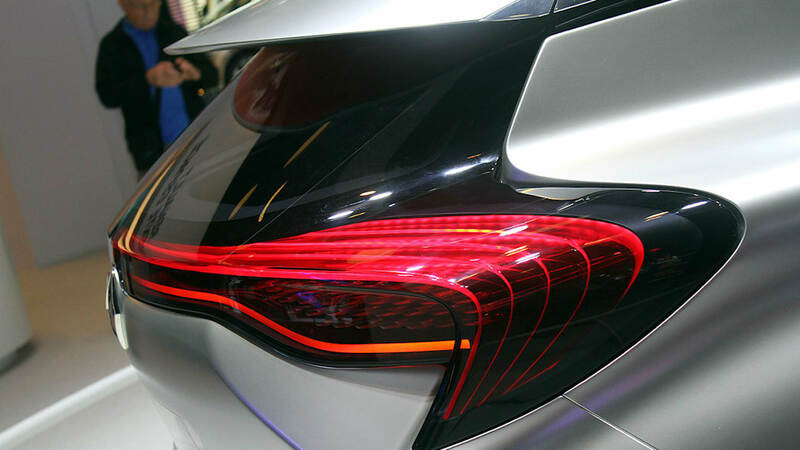 The car's shape was designed to slice through air efficiently, while movable devices such as an active spoiler and lateral vanes perform the same way as ailerons. Z.E. Hybrid technology: this new, compact and affordable hybrid power unit combines ultra-low fuel consumption with zero-emission mobility* for journeys of less than 60km and at speeds of up to 120kph. In coming years, Z.E. Hybrid technology will become complementary to Renault's zero-emission* electric vehicle range. EOLAB forms part of the 'fuel consumption of 2 litres/100km for all' plan introduced within the framework of France's so-called New Industrial Plan. However, EOLAB goes further than the fuel consumption target set by the French government since it sets its sights on the much longer term. 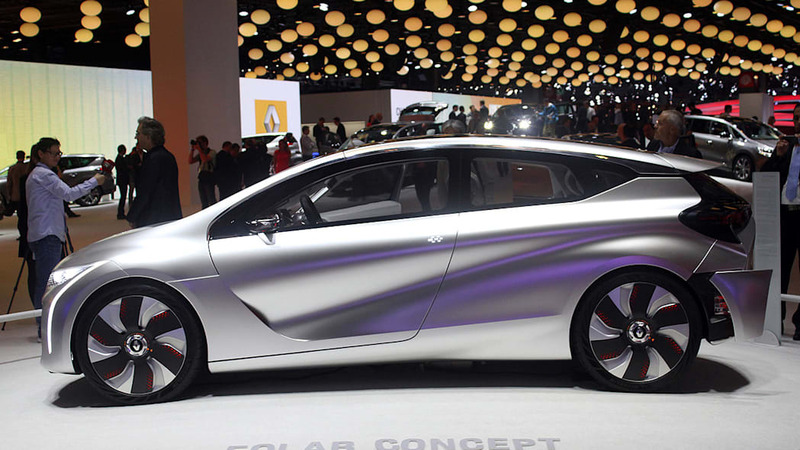 In the course of the prototype's design, Renault developed the technologies necessary for the introduction of a car with fuel consumption of just 2 litres/100km by 2020. 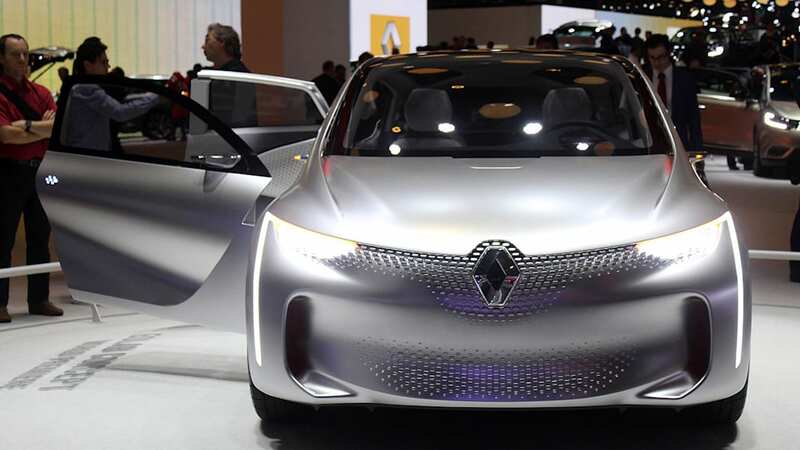 To achieve this, Renault worked in a spirit of collaborative innovation with French automotive industry partners like car glass manufacturer Saint-Gobain, seat supplier Faurecia, tyre company Michelin and Continental (brake system). Renault also worked closely with major partners like the Korean company Posco (magnesium components). The specific know-how of all these partners made a valuable contribution to the success of the EOLAB prototype. 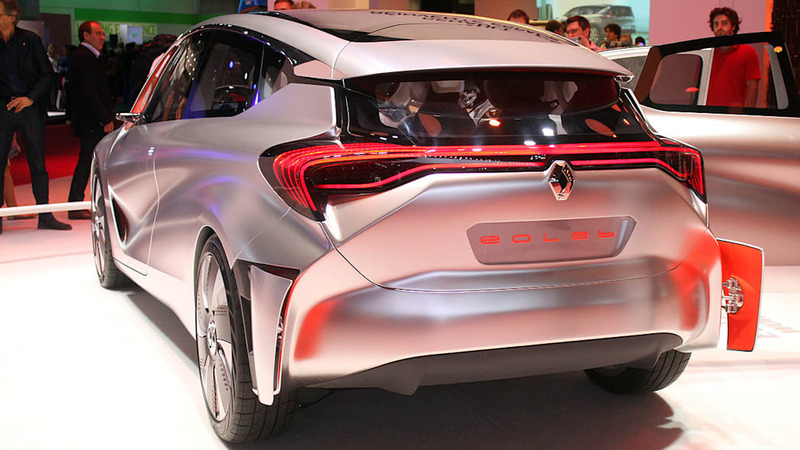 Renault's designers were closely involved with the EOLAB project from its very early days. In the case of EOLAB Concept, they pushed the design parameters to perfect the car's styling and paid significant attention to detail in order to optimise aerodynamics and weight. With its sloping roof and breathtakingly slender rear end, the concept car's true purpose is well masked: beneath its seductively designed shell, everything is geared towards frugality. It demonstrates that Renault is able to add a touch of dream-like magic to a prototype whose fundamental mission is to achieve ultra-low fuel consumption. EOLAB is an eloquent demonstration of Renault's determination to take ever greater steps to reduce the carbon footprint of its vehicles. The goal is to make ultra-low fuel consumption an affordable reality to as many motorists as possible. As a pioneer in the field of zero-emissions mobility thanks to its range of electric vehicles, and also as the 2013 market leader in terms of fuel consumption and average CO2 emissions, Renault is the only manufacturer to have set a target of reducing its carbon footprint by 10 per cent over three years (2010-2013). That goal was achieved in 2013 and the brand continues to be committed to reducing the CO2 emissions of its vehicles during road use, which accounts for about 85 percent of the company's total carbon footprint. Thanks to its range of all-electric vehicles and increasingly efficient internal combustion engines, the Renault Group recorded the lowest CO2 emissions figures of all European manufacturers in 2013 (less than 115g/km)*. * Average CO2 emissions over an NEDC-homologated combined cycle of Renault group passenger vehicles registered in 2013, taken across 23 countries (all of the EU except Cyprus, Malta, Romania and Bulgaria). Source data from AAA-DATA (Association Auxiliaire de l'Automobile), a CCFA subsidiary. AAA-DATA is an association that manages automotive industry data for public authorities. The introduction of EOLAB takes Renault's environmental programme to an even higher level. The target? To make ultra-low fuel consumption as widely available as possible by creating a prototype which blends a raft of cutting-edge features that are realistic in both technical and financial terms. 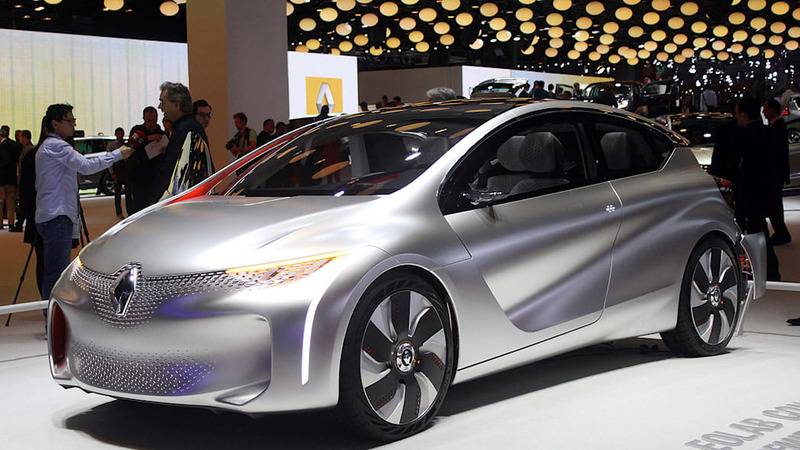 EOLAB's purpose is to highlight Renault's savoir-faire in the fields of design and technology. It is a statement of the company's environmental strategy which strives to reduce the carbon footprint of its vehicles across successive generations. Meet various legislative requirements in different markets and also the Group's commitment to reduce its global carbon footprint (Renault is aiming for a 10 percent fall between 2013 and 2016). Meet customers' expectations by increasing energy economy and cutting running costs at a time of uncertainty about the availability and price of resources. Improve air quality in towns and cities, in line with the wishes of public authorities and motorists. Renault's internal combustion engines have become significantly more fuel efficient over the past decade or so. The increasing electrification of powertrains is symbolic of both improving fuel economy and an opportunity to reduce vehicles' CO2 emissions. It will also gradually increase the influence of renewable energies and improve overall energy efficiency from well to wheel. EOLAB's powertrain benefits from expertise acquired during the development of the Group's electric vehicle range which remains unmatched even today. The technology it packs is innovative in the sense that it enables users to cover substantial distances in built-up areas without any exhaust emissions, then if necessary switch over to a conventional internal combustion engine to continue the journey. As with all Renault projects, the chief challenge was to develop a solution that is affordable to as many people as possible, and thus liable to sell in high numbers. That's a vital consideration if we are to have a significant effect in terms of environmental benefits. Different countries' energy supplies and contrasting usage patterns are pushing manufacturers to expand their ranges and diversify according to local market conditions. As part of the Renault-Nissan Alliance, the Renault group intends to maintain its status as a worldwide market leader in the field of electric vehicles. PHEV (plug-in hybrid electric vehicle) solutions, such as that featured on EOLAB, complement this range and will be developed to suit widely differing driving patterns... but always with the goal of covering significant distances with "zero emissions"*. Without a constant stream of technological breakthroughs, the car's environmental impact would diminish only through models gradually being replaced by others with cleaner internal combustion engines. In that respect, the pace of change is often linked to legislative changes affecting emissions. This is why Renault thinks outside the box, offering ground-breaking technological innovations that are accessible to all. Firstly it has its all-electric vehicles, which emit no CO2 or other compounds from their exhausts, don't create any smells and operate silently. Renault is the only manufacturer to offer a comprehensive range of four electric vehicles. Now, through its EOLAB project, Renault is extending zero-emissions mobility thanks to the development of an innovative hybrid system – Z.E. Hybrid – which allows users to cover trips of up to 60km* at speeds of up to 120km/h with absolutely no tailpipe emissions. According to a scientific modelling study of the Earth's atmosphere, conducted using data from the city of Rome, achieving a 20 percent rate of zero-emission vehicles in the central traffic area would greatly reduce the concentration of pollutants that might be dangerous to our health. In the most polluted streets, calculations revealed a reduction of up to 30 percent for particles that cause respiratory or cardiovascular problems, and up to 45 percent for CO2, a significant respiratory irritant. Alongside Renault's existing range of four electric vehicles, the Z.E. Hybrid proposal is an effective new measure against this threat to public health. EOLAB's weight is around 400kg lighter than that of a B-segment hatchback like the Clio IV. EOLAB's CdA is 0.470m2 (A = 2.00m2 / Cd = 0.235) which represents an overall reduction of 0.200m² (around 30 percent). This lower drag coefficient results in a significant fuel consumption reduction at higher speeds. At a stable speed of 130kph, for example, it accounts for a fuel consumption saving of 1.2 litres/100km in comparison with the benchmark vehicle. NOTE: the measure of a vehicle's overall aerodynamic efficiency is its CdA, i.e. the vehicle's frontal section (A) expressed in square metres multiplied by its drag coefficient (Cd). The CdA of the Clio IV, for example, is 0.670m², which is a good average for its segment. However, CdA gains should not be achieved to the detriment of design considerations or other characteristics, such as cabin space. EOLAB's ride height is variable thanks to the use of active air suspension. The four dampers can be raised or lowered by 25mm in relation to the default setting. When the car is parked, the suspension switches to its highest position in order to facilitate entry. As the vehicle begins to move, the suspension resumes its default setting (i.e. it lowers by 25mm) at speeds of between 5 and 70kph in order to limit the amount of air that passes underneath it. For the same reason, the ride height is lowered by a further 25mm at speeds in excess of 70kph. At the same time, the aerodynamicists focused on a variety of technological solutions and innovations. EOLAB's front bumper, for example, is equipped with an active spoiler that lowers by 10cm at speeds in excess of 70kph in order to restrict airflow beneath the car. Even when a vehicle is designed with a flat underbody, there are still a number of asperities that can detract from aerodynamic efficiency. Another mobile feature of EOLAB's aerodynamic package is the 40cm x 10cm vertically-positioned flaps that are visible on the rear bumper, rearward of the rear wheels. 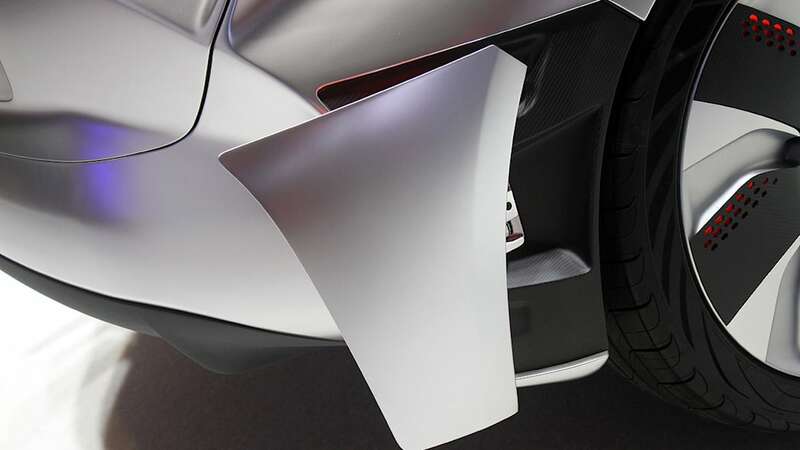 At speeds in excess of 70kph, these flaps open by 6cm in order to ensure that as much of the airflow as possible stays attached to the vehicle as it moves forward. Without this solution, passing air has a tendency to become detached from the vehicle's sides too early after passing the rear wheels and this has a negative effect on drag. In the open position, airflow remains attached to the car as far rearward as possible, right to the trailing edge of the bumper. "These flaps tauten the airflow and prevent turbulence which otherwise acts as a sort of aerodynamic brake," explains William Becamel, the aerodynamics expert who worked on the project. To further perfect EOLAB's aerodynamic performance, it is fitted with particularly narrow, 145mm-wide tyres. That's 40mm narrower than the smallest tyres available for the Clio IV. Michelin and Renault's designers worked on the tread pattern to give a visual impression of width, while the sidewalls were designed to exude an impression of light weight. At the same time, tyre supplier Michelin optimised the casing and tread to minimise rolling resistance while maintaining excellent levels of safety and performance. The tyres' rolling resistance is 15 percent lower than those of the Clio IV which itself is quite strong in this area. These tyres are also lighter, and their profile has been honed to minimise drag. Meanwhile, Renault has changed the technology used for the wheel bearings in favour of a more efficient solution that has achieved a CO2 emissions saving of 1g/km. EOLAB tips the scales at 955kg. That's more than 20 percent lighter than the benchmark vehicle. Total weight savings amounted to no less than 400kg thanks to the teams' holistic approach. This ambitious programme called for extensive work and outside-of-the-box thinking from the different specialists involved. While delivering the same level of performance, lighter vehicles require less energy to move forward. One of the chief focuses in the case of the EOLAB project consequently consisted in reducing the vehicle's overall weight. This in turn meant that the vehicle's principle assemblies (powertrain, brakes, running gear, cooling system, fuel tank, etc.) could also be lighter, and these additional savings compounded the initial groundwork. "The savings achieved by taking a fresh look at the size of the different mechanical assemblies enabled us to cover the cost of using more expensive materials and technologies elsewhere without losing sight of the aim not to add to the overall cost." Laurent Taupin (EOLAB Project Leader). To reduce a car's weight, a well-trod path is to replace steel with lighter materials. All-aluminium and aluminium/carbon solutions already exist but, in addition to the high cost associated with such materials, they often necessitate an in-depth review of assembly and production processes, and there is a price to pay for that. True to its philosophy, Renault chose to steer clear of radical solutions. "You can always save weight if you're prepared to pay the price, but that would be contrary to Renault's philosophy. Our strategy is to reduce weight in a way that benefits everybody. That means finding economically viable solutions that our customers can afford. Our approach can be summed up by the phrase: 'the right material for a given job'," underlines the EOLAB Project Leader Laurent Taupin. This undertaking to contain costs went hand-in-hand with a significant constraint, however, and that was to identify weight-saving solutions that are compatible with today's production processes. Employing the right material for a given job involved conceiving an innovative body shell that combined different materials selected as a function of their weight, cost and necessary production processes. EOLAB's body shell consequently combines steel, aluminium, magnesium and plastic composites, whereas the majority of today's cars are made of a single type of material. Over and above changes to a car's basic architecture, the only way to lighten steel components is to use thinner metal. However, since detracting from a given part's functional properties was out of the question, it was necessary to upgrade the mechanical properties of the steels employed at the same time. Renault consequently turned to Very Very High Elastic Limit steels which have a yield strength of between 1,200 MPa and 1,500 MPa, an improvement of between 200 MPa and 500 MPa over the VHEL steels used for current Renault models. With a tensile strength of up to 150kg/mm2, these grades were employed wherever their use served a real purpose, notably for the front part of the cabin. Their use requires a process known as hot stamping which Renault already uses for its production cars. EOLAB's highly innovative shell features a significant proportion of aluminium in different, readily available forms such as sheeting, castings and profiles. Like steel, upgrading the mechanical properties enables thinner grades to be used with no detriment to a part's function but with an additional weight saving over conventional aluminium. Here again, these grades were selected in cases where it was possible to optimise the trade-off between function, mass, cost and the required manufacturing processes. Some of them necessitated a new warm stamping process (approximately 250/300°C, compared with hot stamping which is closer to 900°C) but this was compatible with existing stamp shop facilities. A combination of castings, sheet metal and profiles was chosen for EOLAB's all-aluminium rear circumferential chassis member . Their use represented a good compromise between mass and body rigidity. Moreover, using the same material for this part of the shell was an attractive proposition in terms of thermal expansion. Indeed, body shells are exposed to temperatures of up to 180°C in the paint shop curing ovens and certain multi-material assemblies can have a negative impact on body shell's geometry. Advantage was also taken of the use of cast parts of varying strength to cover multiple functions, that is to say the use of large, one-piece components to replace a number of smaller parts. This made it possible to compensate for the technology's additional cost compared with conventional stamping. While using steel and aluminium for a car body is itself not usual, Renault went further down this path in the case of EOLAB by making use of magnesium, too. This metal is reputed for its light weight (density: 1.7), but it is also prone to corrosion which is why it has only been used for interior components until now. Some cars already feature magnesium but only for moulded parts made from magnesium powder (e.g. the majority of the market's steering wheel armatures). "Magnesium sheeting cannot be used for as wide a range of parts as steel, or even aluminium. However, where the compromise between function, mass, cost and manufacturing processes allows, there are spectacular savings to be achieved, especially as the manufacturing process is the same as it is for certain new grades of aluminium, i.e. warm stamping," points out Vincent Desmalades, Deputy Project Leader in charge of Processes. In order to cover as many realistic solutions as possible to minimise EOLAB's weight, the project team also took a look at polymers which have long been reputed for their benefits in this area. Assisted by university laboratories and specialist suppliers, the team behind EOLAB worked on a new family of thermoplastic resins which are easier than thermoset resins to recover at the end of the vehicle's life cycle and consequently recycle. The demonstration car's front, rear and central floor pans, B pillars and lower cross member are all made from hot-stamped composite thermoplastic, while the skins of the one-piece wings/bonnet assembly and doors are made from injection moulded thermoplastic. The type and proportion of the glass fibres mixed with these polymers vary as a function of the properties required for each end-use (e.g. longer fibres for structural components). After attending to the body shell, EOLAB's designers turned their focus to the car's main assemblies which were all scrutinised with a view to saving weight. The brakes, steering, suspension, wheel and tyres were all looked at carefully to shave off kilogrammes without penalising their performance. A vehicle's running gear alone accounts for almost 20 percent of its weight (e.g. the Clio IV = 225kg). The most efficient solution involved replacing steel with aluminium for a significant number of heavy parts, such as the subframe, which has shed 5.3kg compared to that of the Clio IV (14kg), suspension arms (1.8kg saved), hub carriers (5kg saved) and rear arms (9kg saved). Substantial savings were achieved in this way, but EOLAB's designers didn't hesitate to explore other, more complex solutions. For example, they took a totally different approach to the architecture's resistance to head-on impacts while maintaining the same overall level of safety performance. Normally, programmed chassis deformations affects three areas in an impact: the upper part of the chassis, the side members and the lower part of the chassis). In the case of EOLAB, the latter's 'add-ons' were eliminated but this was compensated for by relocating and strengthening the side members. The resulting saving was between seven and eight kilos. "We also looked at making the springs from a glass fibre/thermoset plastic composite, which would have produced a saving of three kilograms. Using a different composite for the rear beam would have saved another three kilos or so, too," notes Laurent Taupin. One might be forgiven for thinking that brake systems cannot make any sort of contribution to curbing CO2 emissions, yet they can. Indeed, reasonably big weight savings are to be made in this area. 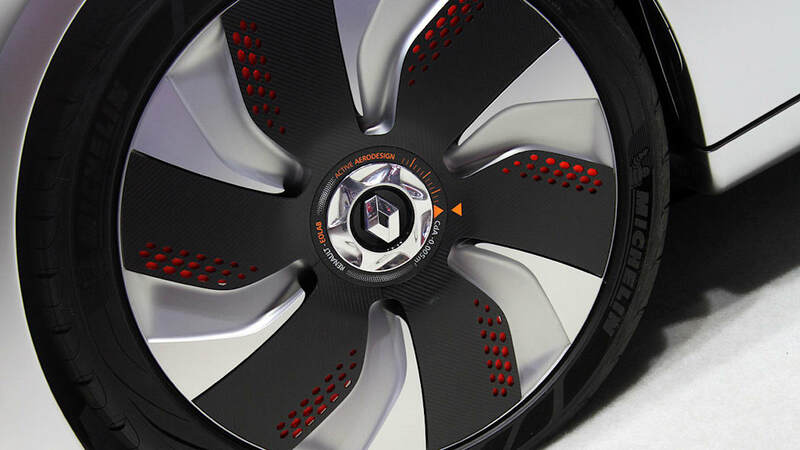 "EOLAB's innovative brake system was developed in conjunction with Continental and points to the road down which Renault intends to go for its electric and hybrid vehicles in years to come," says Laurent Taupin. For the same stopping performance, work on the brake system yielded a total saving of 14.5kg. No fewer than three advanced innovations were developed in association with Continental. The most visible contribution was to suppress disc rub, whereby the brake pads remain in contact with the discs even when there is no pressure on the pedal. This constant rubbing adds slightly to fuel consumption. In the case of EOLAB, the pads do not touch the discs whenever the driver's foot is off the pedal. In addition to being beneficial to fuel consumption, this also extends pad life. To maintain the same speed of response, and even improve it, EOLAB's system eliminates slack by moving the pads closer to the discs the instant the system detects that the driver intends to apply the brakes. Furthermore, the system's new brake control unit has replaced the control units of several previously distinct functions (ABS, ESP, emergency brake assist) while allowing decoupled braking which is indispensable when it comes to recovering braking energy to reduce energy consumption. Meanwhile, the front brake discs have been lightened by combining steel and aluminium. The part of the discs in contact with the pads is made of steel, while the central part is made of aluminium. Also, since the body shell is lighter, it was possible to reduce the diameter of the discs for a total saving of 4.7kg. Also in partnership with Continental, Renault took advantage of this arrangement to make the automatic parking brake act on the rear drums. This is more economical than the market's existing system. Suppressing the manual mechanism (lever, cables, etc.) adds another 1.3kg to the total weight saving. The EOLAB team also secured appreciable savings by reviewing the car's glazing. Work to reduce the glass's weight led to collaboration with Saint Gobain Sekurit with the aim of saving between 30 and 50% compared with present-day standards. The thickness of EOLAB's windows was reduced to 3mm (1.5mm less than the current norm), equivalent to the thickness of a pencil line. The thin windscreen, the form of which is particularly aerodynamic, is an automobile industry first. The side windows use laminated glass (instead of tempered glass), while certain non-moving windows make use of polymers which have become a widespread material for optical glass, but are still rarely seen in the car industry. Combined, these solutions brought the total weight of EOLAB's windows down to 21kg, a 25% saving over a Clio (28kg). (For further information, see appendix at the end of this document). "We could have settled for existing processes or recipes for EOLAB, but that wouldn't have been in the spirit of the project which has allowed us to extend our expertise. It has also focused the attention of the whole company on the issue of minimising weight without losing sight of production-related realties," explains Laurent Taupin. 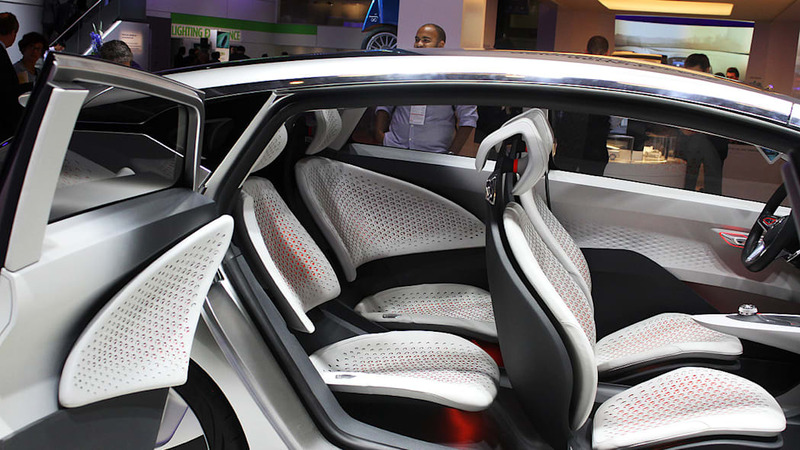 EOLAB's seats also came under the scrutiny of the car's designers who not only endeavoured to make these generally heavy items lighter but also sought to make them slimmer to free up extra room for rear passengers. The seat shells were lightened thanks to Faurecia's Cover Carving technology which consists in embedding a rigid 3D pattern onto a textile support to enable the cover to match the seat back's forms as closely as possible. The use of this technology shaved 40 percent off the weight of the seat's shell and provided rear passengers with three centimetres of extra room for their knees, legs and feet. 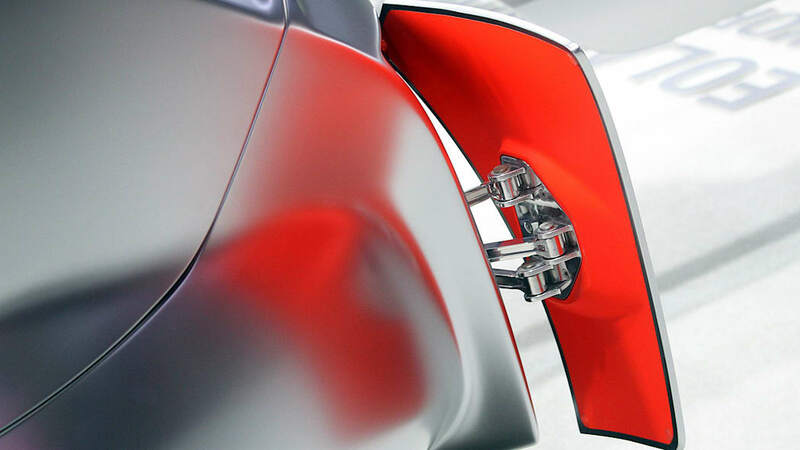 Close attention was paid to EOLAB's smaller plastic fittings, such as the B-pillar trim. "These parts may only weigh a few hundred grams each, but they add up to about 10kg in the case of a production car if you include the boot lining," points out Laurent Taupin. With input from suppliers, Renault's specialists looked at alternative ways to make these plastic parts. One idea was to replace solid parts less than 2.5mm thick with parts comprising an ultra-thin skin (1.8mm) and injected with foam which is lighter because it contains air bubbles. Thanks to the incorporation of ribbing, they boast the same structural strength. Until now, this technique has been restricted to large visible parts or parts that customers cannot see. In the case of EOLAB, the challenge was to find a process that would be appropriate for smaller visible parts. Meanwhile, for EOLAB's boot trim, Renault used another experimental technique which again uses a sandwich structure comprising a foam insert between the two outer surfaces. This sandwich is obtained by slightly opening the mould during production to allow the foam to spread. Use of thinner fittings achieved a weight saving of between 20 and 30 percent. Meanwhile, plastics specialists took a close interest in the air intake ducts which are generally made of compact polypropylene and tip the scales at around 3kg. "Three kilos to channel airflow is too much," believes Laurent Taupin. The idea was therefore to replace this material with expanded polypropylene which is much lighter since its density is 0.06 compared with 0.96 in the case of compact polypropylene. However, if it had simply been a case of swapping one for the other, the switch would have been made a long time ago. In reality, it calls for duct walls that are five times thicker and that in turn means taking a fresh look at the car's architecture. This is effectively what happened in the case of EOLAB and its ultra-light air ducts have been patented. They weigh just 700g, which is a spectacular saving of 2.3kg! In the case of the EOLAB prototype, the ICE part of the powertrain takes the form of a small three-cylinder 999cc petrol engine with a power output of 57kW (75hp) and peak torque of 95Nm. It is mated to a highly innovative clutch-less transmission based on a compact and economical three-speed gearbox which is sufficient to cover the vehicle's speed range. This is a notable advantage compared with the majority of the market's hybrid technologies which make use of CVT- or DCT-type transmissions (Continuous Variable Transmission, or Dual Clutch Transmission). These tend to be bulky, heavy and costly, and consequently ill-suited to small cars. The chief feature of the concept lies in the clutch casing which houses a permanent magnet electric motor (axial flux discoid motor in the case of the prototype). This motor is compact and economical and covers the need for the availability of extra torque since it is capable of instantly delivering peak power of 40kW and 200Nm of torque. It is important to note that the first two ratios of the three-speed gearbox are mated to the electric motor, while the third ratio is linked to the ICE. These three ratios permit nine different combinations for the electric and hybrid modes combined. One of the concept's major innovations is the fact that gearshifts do not necessitate the use of a clutch thanks to a specific control unit designed by Renault's engineers. EOLAB's axial flux permanent magnet electric motor is powered by a 6.7kWh lithium-ion battery which differs from the batteries that equip Renault's Z.E. range of electric vehicles. While electric vehicles are designed to store a high amount of energy because of the fundamental need to maximise the vehicle's range, hybrid vehicles like EOLAB need to cover the same power requirement with a limited quantity of electrical energy. This entails using a different type of battery cell with a higher power/energy ratio. The 'weekday' mode favours the use of electrical power for everyday journeys (e.g. from the home to the workplace) in order to get as close to zero tailpipe emissions* and zero fuel consumption* as possible. EOLAB's range is sufficient to cover 60km* under electrical power. When this mode is selected, the car always pulls away under electrical power and the first gear allows speeds of up to 60/70kph to be reached. At faster speeds, the system automatically engages the second gear and continues to run on electricity alone up to 120kph. Beyond this speed, the hybrid system automatically calls on the internal combustion engine which drives through the third gear. The 'weekend' mode combines both sources of power to permit longer travelling distances. Although the car still pulls away under electrical power, the internal combustion engine is engaged at a lower speed. The two power sources then combine, not only to use less energy but also to benefit from a real power boost thanks to the association of the ICE's 57kW (75hp) and the electric motor's 40kW . In this mode, the battery charges under deceleration and braking (range saver function). The combination of the different gear ratios covers use up to the vehicle's top speed in hybrid mode. This is a major concept that shows a way forward for hybridisation. "Today, most of the market's hybrid vehicles are higher segment cars with a price tag of more than €40,000. The solutions showcased by EOLAB are much more economical and enable hybrid technology to be used for smaller cars and on a much bigger scale. Our objective is to produce a car with two power sources for the price of one," underlines Jean-Pierre Fouquet, Z.E. Hybrid Innovation Project Leader. Although Renault's first hybrid vehicle – EOLAB – is packed with technologies and innovations, it is still aimed at the brand's core customers, so had to remain easy to use and intuitive. It was also developed in keeping with Renault's Driving eco² philosophy. At the same time, its Human Machine Interfaces (HMI) go even further down the road of providing information in real time with a view to helping drivers to benefit from ultra-low fuel consumption. Visualisation of EOLAB's technological features: the EOLAB demonstration car is equipped with aerodynamic features like an active front spoiler and active flaps which deploy at speeds in excess of 70kph. Intuitive: despite the car's advanced technological content, the MMI was designed to be simple to use. "When a car targets a broad public, it is important that its use is easy to take on-board without having to read a manual that is dozens of pages long. In this respect, EOLAB follows the example set by R-Link which has received numerous accolades for its intuitive ease of use." Given that on-board active systems are not visible from inside the vehicle and are only triggered at speeds or more than 70kph, the driver may feel a certain degree of frustration. Renault has endeavoured to avoid this issue by incorporating a specific function into the multimedia tablet which enables all of these systems to be activated and displayed whilst the car is at a standstill. "When an EOLAB-derived production car sees the light of day, it will not only be purchased out of economic motivation. Customers will also be attracted by its environmental and technological benefits. They will therefore want a 'quantifiable return', and this type of function will meet that requirement. Renault is keen to demonstrate that it is possible to drive an ultra-economical car whilst at the same time enjoying the experience," underlines Rémi Bastien. Its content is spread across two digital displays the size of a smartphone: the one on the left provides all the technical information (speed, levels, conventional warnings), while right-hand side display is dedicated to the GPS. The upper part is utilised to display the image generated by the central rear-view camera. The lower part covers all of the multimedia system's controls (radio, climate control, etc.). All of the other functions are to be found on the touch screen display, allowing for the dashboard layout to be simplified, in-keeping with the spirit of EOLAB's uncluttered design. The screen of this 11-inch tablet is divided into two parts. For the first time in the automotive world, the tablet can be fitted either horizontally or vertically, with distinct display graphics for each position. "In the vertical position, the accent is placed upon the sharing of information, which is easily visible to the other passengers. In its horizontal position, the screen is brought closer to the driver, generating a 'cockpit' effect, whilst the display graphics becomes warmer and more colourful," explains Patrick Lecharpy. This unprecedented horizontal and vertical duality required specific studies and research to ensure that the two positions were compatible with the vehicle's safety features, most notably its airbags. Another noteworthy point: "With EOLAB being a hybrid vehicle, the drive mode is visible in an informative and educational manner on the tablet by way of cloud-shaped symbols that are blue when EOLAB is powered by its electric motor and turn red when the internal combustion engine takes over. What's more, the size of these clouds varies according to the quantity of energy available in each mode," reveals Patrick Lecharpy, the project's design manager. Generally speaking, with energy consumption being at the very heart of the EOLAB concept, significant attention was paid to the presentation of related data. 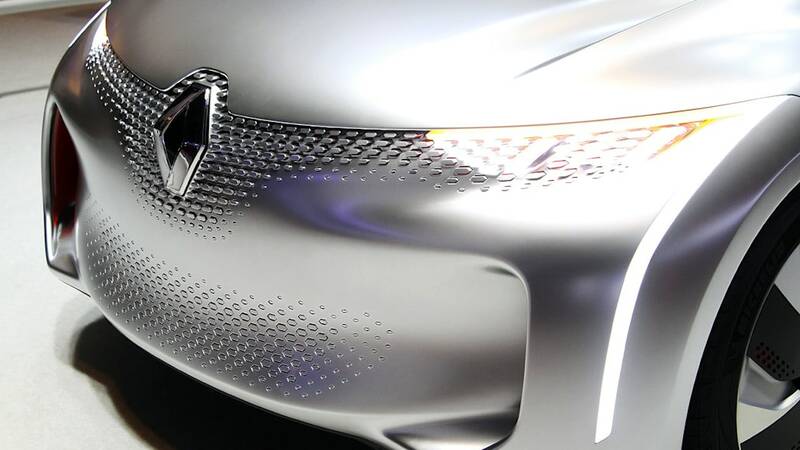 "As this is Renault's first hybrid vehicle and an ultra-economical car, we really wanted the Human Machine Interfaces to permit a comprehensive understanding of the parameters that influence consumption, in order to assist drivers as they learn how to drive more economically," indicates Laurent Taupin. This graphic alters in real time according to the status of these five key parameters, thereby providing the driver with indications about how consumption may be improved in real time. "Today, after a fashion, the majority of the systems available in the market give drivers just raw information (current consumption, average consumption, etc.) that don't really enable them to make any progress. Courtesy of this graphic, drivers now have at their disposal the necessary tools to take charge of their own consumption," continues Jean-Pierre Fouquet, Z.E. Hybrid Innovations Project Leader. Weight reduction, aerodynamic efficiency and hybridisation were three key themes that were explored with a common objective – that of developing realistic solutions that are transferable to mass-production cars. "Beyond the prototype, we need to make advances across the entire range," affirms Project Leader Laurent Taupin. Similarly important to note is the fact that the lower fuel consumption figures have been achieved without impacting the vehicle's performance in any way: "However efficient and economical it is, the vehicle must also remain competitive in every area if it is to attract buyers. This includes comfort, road holding, cabin space, perceived quality and design." When it comes to reducing weight, there is always the option of resorting to lightweight materials such as titanium, carbon-fibre or other composites, but in view of their expense, their wide-scale use would inevitably raise the price of the car. Such a scenario would be contrary to Renault's very ethos, which is to make its cars available to the highest possible number of customers. What's more, a very lightweight and expensive vehicle would remain something of a niche in commercial terms and, as such, would not generate any real benefits for the environment. EOLAB was developed with the target of producing a level of performance and price tag representative of a B-segment vehicle. The EOLAB project team thus paid careful attention to the key parameter of cost. With EOLAB, however, the process was different. All of EOLAB's technological solutions were evaluated not only in terms of their capacity to reduce fuel consumption and CO2 emissions, but equally in a context of constraints relating to the real world in relation to production processes, technology and costs. "We worked directly with the teams that develop Renault's production cars, and they suggested new solutions to us in our quest for ultra-low fuel consumption. Not only did they propose these new solutions, but they also helped us to envisage what their implementation would signify on a larger scale. This project's process of innovation is therefore already in-place for future vehicles in the Renault range," observes Laurent Taupin. 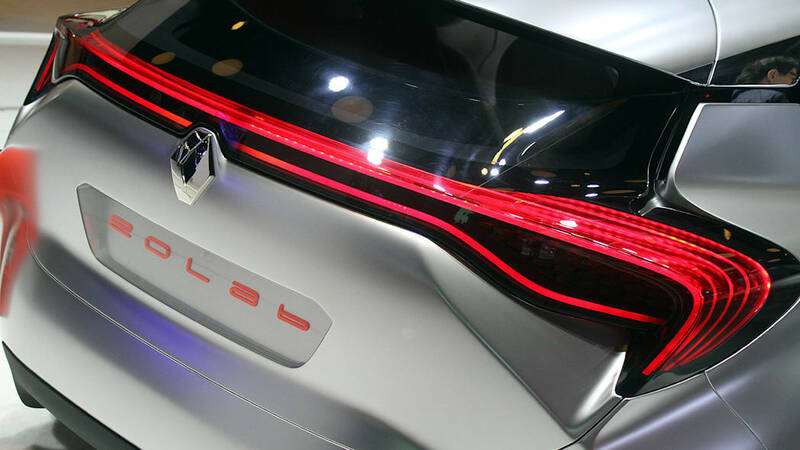 At the heart of the EOLAB project is the prospect that all of the technological innovations developed as part of the process will be able to be transferred across to mass-production cars by 2020. This focus upon realism does not, however, signify that Renault is shirking away from envisioning more futuristic or avant-garde solutions. Quite simply, these were not (yet) necessary for this project, the aim of which was to reduce the CO2 emissions of the brand's range in either the short or medium-term. This pragmatic approach went hand-in-hand with a number of conditions of entry for the core technologies that are potential inclusions in EOLAB. Cost and feasibility are important considerations, but the primary concern is their compatibility with existing production facilities with limited investment. Particularly close attention was paid to the question of manufacturing realism and the question came under the auspices of Vincent Desmalades, EOLAB's Assistant Project Leader in this area. He explains that "the priority was to strike the right balance between two extremes: one the one hand, to reject everything that deviated from accepted standards, at the risk of no longer innovating, and on the other hand to openly give free rein to imagination and the unpredictable financial consequences that might entail". It was a balancing act that was not necessarily simple to achieve since one of EOLAB's overriding guidelines was to design an extremely innovative multi-material body, combining steel, aluminium, magnesium, composites and injected thermoplastics – something that had never before been done in mass production. In order to establish the right positioning, the EOLAB team integrated production compatibility into the project's mind-set from the very start. Alongside the EOLAB prototype, Renault is presenting EOLAB Concept, a second take on an ultra-low consumption vehicle, in the form of a concept car. Showing that efficiency can go hand in hand with appeal, this concept places particular emphasis on design, slotting into Renault's design strategy with simple, warm and sensual lines conveying a strong sense of emotion. It belongs on the sixth petal of the life cycle daisy, representing Wisdom (understanding, an open mind, serenity). Some of the design features of EOLAB Concept prefigure trends that could find their way onto production models. EOLAB Concept was inspired by the prototype but it takes the design to a new level. All the fundamentals of the prototype are maintained in terms of aerodynamics, proportions and interior space, with the features expected of a B segment car. EOLAB Concept is a realistic vehicle, shown in its best light. This is because, in order to fully express the concepts of aerodynamics and lightweight construction, designers simply took the car's ideal lines and attention to detail a little further. Even when it is subject to strict design constraints, in pursuit of very low consumption, concept cars must still capture the imagination. Patrick Lecharpy, Vice-President, LCI (see insert) and Alliance Synergies, tells us how the duo came about: "A technology demonstrator is rarely attractive. And a concept car is rarely realistic. That's why we decided to develop two vehicles as part of this project. The concept car emphasizes the visual aspects of the demonstrator and seeks to take design solutions a bit further under the final authority of the design department, while the prototype design came under the authority of the engineering department. The aim was for technology and desirability to go hand in hand, to avoid a result that would be high-tech but cold." EOLAB Concept is therefore a unifying symbol, expressing high-tech innovation at Renault while fully reflecting the brand's design strategy. The Cooperative Innovation Laboratory (LCI) is an independent structure operating within Renault. The aim of brand management was to set up a creative entity with a collaborative function, grouping engineering, product and design staff in the same working space. This original organization has spawned a dynamic and creative entity, able to respond to needs quickly. A real wellspring of new ideas. Made up of around forty people, "LCI is a bit like a start-up inside a major company. Conditions are ideal for developing innovations and breakthrough concepts," explains Patrick Lecharpy. 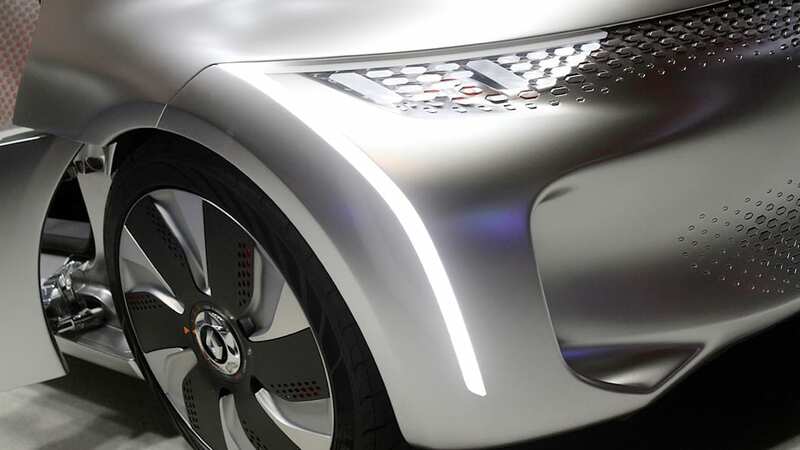 Everything about the appearance of EOLAB Concept reflects the impressive aerodynamics and reduced weight of a vehicle designed for ultra-low fuel consumption: flowing lines, harmoniously integrated aerodynamic functions, surfaces and glazed areas... But there was no question of designers dispensing with the sensuality expected of a Renault concept car. "At first glance, EOLAB Concept expresses the concept of aerodynamics. Further, and above all, it must be a desirable, flowing, sensual object, heralding the design trends that we can expect to see in the near future," explains Axel Breun, Design Director, Concept Cars. The EOLAB project aims to make intelligent use of the constraints necessary for exceptional aerodynamics. There was no question of simply opting for a teardrop shape which, although ideal from many standpoints is not very attractive and too limited in terms of interior space. A real designer's challenge, particularly as "Drawing a car four meters long with a good CdA (frontal area) is a particularly tricky exercise," explains Patrick Lecharpy. "We had to build a cell combining seating and space for passengers with the visibility and accessibility of a B segment production model. At the same time, we had to respect particularly stringent aerodynamic constraints in terms of projected frontal area, roof height, narrower rear tracks, front air curtain, rear-end air flow separation, and so on.." A condition essential to the success of the project was the perfect understanding between designers and aerodynamic engineers enabled by the Cooperative Innovation Laboratory. Particular emphasis was placed on the front end of the car. The aim was to ensure visual continuity and to provide a specific light signature featuring headlights with full LED mini pixels that gradually repeat and extend the pattern of the radiator grille. On the lower part of the bumper, mobile motorized mobile parts of identical shape cool the engine if required. The sculpted hollowed-out lines of the side panels leave room behind the front wheels for generous air passages that contribute to the aerodynamic flow around the front wheels. 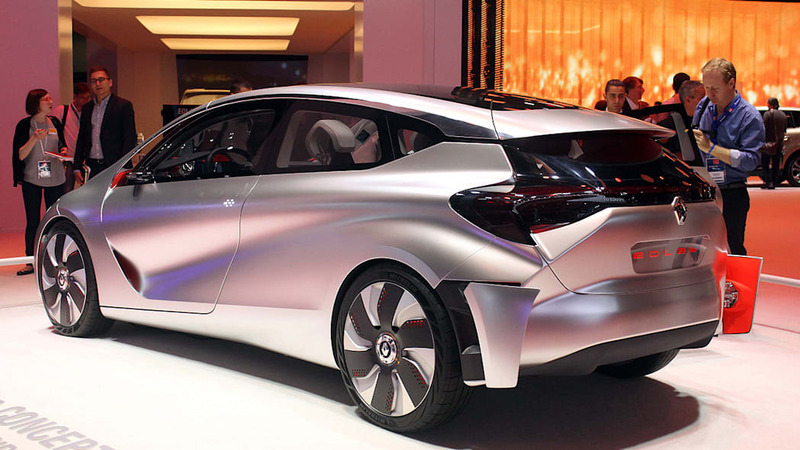 This design also authorizes wide shoulders that contribute to the dynamic looks of this concept car. The 19" carbon-aluminium wheels feature an original layout that contributes to vehicle aerodynamics by closing up, depending on speed. EOLAB Concept features a roof of taut, semicircular lines with a forward-set windscreen and windscreen pillars whose relief reaches the front of the bonnet, extending the roof lines. At the rear, the discreet continuity of the glazed area and extended overhang create the impression of a floating roof, suggesting a strong airflow in the slipstream behind the car. The design of the transparent surfaces underlines the overall impression of lightness: a polycarbonate roof revealing the structure of the car, side windows forming a continuous line through to the slim quarter-window, concealing an air passage. A feature contributing to air flow separation behind the car, like the large mobile aerodynamic deflectors positioned behind the rear wheels and designed to adapt to vehicle speed. The lines of the concept car are underlined by a spectacular colour called Liquid metal, with the shimmer of polished aluminium. 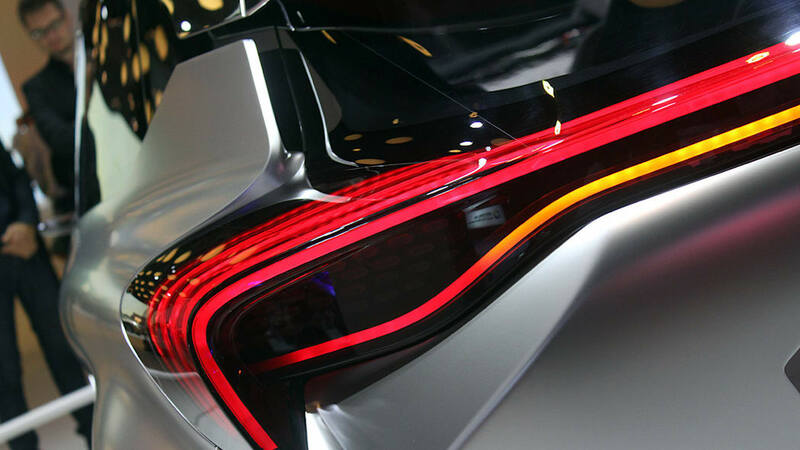 Touches of fluorescent orange underline the operation of aerodynamic features. The slim, rear LED lights contribute to the light signature across the width of the vehicle and are directly built into the rear window. EOLAB Concept adopts an asymmetric structure with three doors, a solution that increases both weight and safety for passengers getting into the car from the kerb side. The car has one door on the left, and two doors on the right, both of which are rear-hinged. A floating central console contributes to the overall impression of lightness, as do the slender seats mounted on central rails to provide better accessibility and more leg room at the rear. The four individual seats are real cocoons with, at the rear a side trim piece for an even greater impression of comfort. The seats are upholstered in perforated leather with a 3D pattern reflecting the "haute couture" aspect of EOLAB Concept and contrast stitching in fluorescent orange as on the bodywork. This pattern resembles the "pixelated" appearance of the front bumper, while also expressing the lightness of the concept. The same pattern can be seen in relief on the dashboard and side panels. The interior characteristics of EOLAB Concept make it highly realistic, a definition expressed from a different visual perspective by the EOLAB prototype, a car ready to take to the road and to demonstrate all the qualities of this ultra-low consumption vehicle. The EOLAB project is Renault's contribution to the 'FUEL CONSUMPTION OF LESS THAN TWO LITRES/100KM FOR ALL' part of the French government's 'New Industrial Plan', an initiative of the country's Minister for the Economy, Industrial Renewal and Digital Affairs. Under the guidance of the 'Plateforme Française Automobile', this plan seeks to promote the development of technological 'building bricks' with a view to identifying ground-breaking ways to curb CO2 emissions at a cost customers can afford. EOLAB makes use of the 'bricks' developed by French automobile industry players in addition to exclusive Renault innovations. The first of these solutions, which have all been developed with an eye for technical and economic realities, will reach the production stage by2015 in order to begin marketing the first vehicles with fuel consumption of less than two litres /100km by 2020. The plan involves the country's entire automobile industry, from major groups to small-medium companies and public sector laboratories. In total, more than 160 businesses and bodies have shown an interest in playing a role in this research programme. The total R&D investment envisaged at this stage is estimated to be around €1 billion over the next five years. The French state will contribute €250 million in the form of aids, with around 20 R&D projects in the frame for its support in 2014. 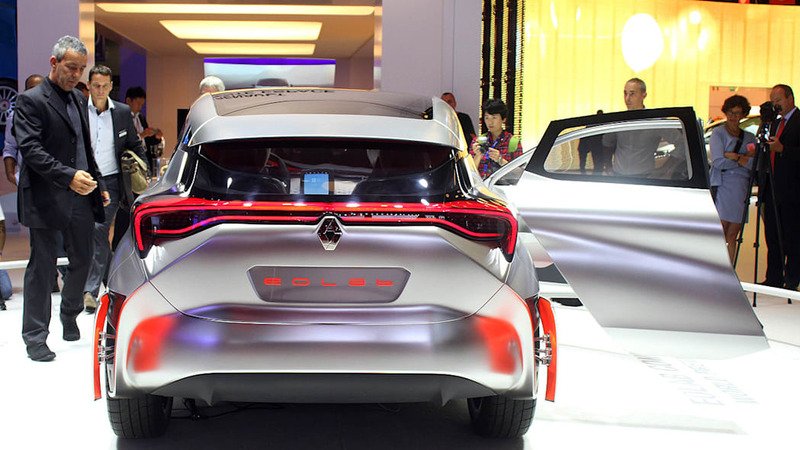 Renault was among the beneficiaries for the development of its EOLAB project which took advantage of the know-how and innovations of world-renowned French suppliers and partners. With a nearly 350 year's tradition, the French Saint-Gobain Group developed four major business activities: products for construction, distribution for the building industry, innovative materials, and packaging. Saint-Gobain Sekurit, a Saint-Gobain Group subsidiary, belongs to the Innovative Materials branch. A leading manufacturer in the automotive glass sector, the company has an international presence and is tear one supplier for most automakers. Of the three main families of automotive glazing (tempered, laminated, and polymer*), two will be the subject of a major R&D project with the objective of reducing the weight by as much as 30 to 50% compared to the current standards. This weight reduction is intended to make a significant contribution to the target set by the French authorities during the October 19, 2012 Strategic Committee of the automotive branch meeting. The objective is to develop a vehicle that only consumes 2 liters/100 km in order to reduce CO2 emissions to the level established by the European authorities of 95 g/km by the year 2020. The Super Alma project in partnership with Renault is part of the 2L/100 programs and aims to push the weight reduction of automotive glazing to the limit while still ensuring the acoustic and mechanical performances demanded by users. Side windows: use of thinner laminated glazing instead of tempered glass. Rear: the objective is to replace the tempered glazing with a polymer rear backlight. As with mineral glazing, organic glazing contributes to lowering pollutant emissions thanks to the weight reduction and allows complex and aerodynamic shapes. To be noted that Aerodynamic glazing has considerable influence on vehicle performances. It should be noted that Saint-Gobain integrates eco-design in its R&D projects. The LCA (life cycle analysis) tool used throughout the Super Alma project thus ensures the environmental integrity of the proposed solutions. This will therefore respond to the requirements of the 2l/100 project by proposing raw material-production method combinations with a low environmental impact. For years now, Faurecia – the world's 7th largest automotive equipment supplier and the largest in France – has been working to make vehicles lighter and more energy-efficient, two of the main factors in cutting fuel consumption over the medium and long term. Achieve maximum weight reduction in exhaust line components while maintaining high-efficiency emissions control. Faurecia has drawn on its in-house innovations to reduce the thickness and weight of the front seat, providing more space for rear passengers without compromising on safety and comfort. The front seat structure is 35% lighter than seat structures in B-segment vehicles, thanks to an optimal combination of multiple structural materials (steel, non-ferrous alloys such as aluminum, and carbon fiber composite). Faurecia has also been collaborating closely with Renault engineers to enhance seat architecture. The sculpted, semi-rigid casing and adaptive-comfort seat back have yielded a seat that is 30% more compact, offering greater space for rear passenger knees, shins and feet while preserving a comfortable ride and the full array of seat adjustments for front passengers. Lastly, with Faurecia's proprietary "Cover Carving" technology for producing textiles with raised contours and added rigidity, the rear shell of the seat back conforms as closely as possible to the seat's rear surface. This technology reduces the weight of the rear shell by 40% while providing three additional centimeters of leg room for rear passengers. As a result of all these innovations, which will be exhibited on Faurecia's booth at the Paris Motor Show (Hall 1, Stand 521, aisle D), Renault can offer a vehicle that provides the roominess of a car in the segment above (+3 cm), but weighs 3 kg less. After factoring in the weight savings of 4 kg on each front seat achieved through Faurecia's choice of materials, the Group has helped Renault trim the equivalent of 11 kg from the vehicle's weight – that's 1.1 g of CO2/km. Since the vehicle is still in the prototype stage, Faurecia's R&D teams will now be focusing their research on the best materials for reducing seat weight in line with manufacturing constraints. To meet Renault's 33% weight reduction target, Faurecia engineers designed an integral structural floor consisting of front and rear floors made from a fiberglass-reinforced thermoplastic material that was created using a hot-stamping process. In addition to offering excellent mechanical performance for complying with crash test requirements, not to mention recyclability, this fiberglass-reinforced composite thermoplastic derived from polyamide (PA 6.6) provides the option of welding or overmolding to eliminate the added cost and weight of glue. Furthermore, it can withstand exceptionally high temperatures during cataphoresis. To reduce the noise generated by this decrease in weight, Faurecia redesigned the floor structure itself as well, adding acoustic components between the upper and lower layers of the thermoplastic assembly. Faurecia's research into the floor materials and architecture enabled the Group to develop a floor that is 16.5 kg lighter (equivalent to 1.65 g of CO2/km) than a traditional steel floor (11.5 kg lighter for the front floor and 5 kg lighter for the rear floor) and meet Renault's 33% weight reduction target. A prototype that points the way toward vehicle weight savings and showcases this new floor architecture will be on display at the Faurecia booth and could be ready for production within four to five years. In order to find the best possible solution for Renault, Faurecia applied a comprehensive approach to developing the exhaust system. The exhaust line architecture was partially redesigned to allow for the use of more lightweight plastic materials as opposed to steel. The manifold and fuel emissions control components were borrowed from current production models. To integrate these materials into the exhaust line, Faurecia engineers opted to replace the rear muffler's acoustic component with a resonator that uses a gas bifurcation system to keep the temperature below 200°C – the highest temperature at which the plastic maintains its resistance. As a result, Faurecia was able to incorporate a Helmholtz resonator made of a composite plastic (polyamide) making its first appearance in an exhaust line. Six times lighter than steel, this new material offers weight savings of 50% over a conventional resonator. In addition to being lighter, the Helmholtz resonator substantially muffles low frequencies and reduces hum inside the passenger compartment for greater comfort. Faurecia also studied ways to slim down the exhaust line's steel components, producing some internal components that are now just 0.6 mm thick. In addition, the exhaust line has been shortened by about 1.5 meters (compared to the Renault Clio Energy TCe 90), ending just in front of the rear wheels. As a result, the exhaust line and emissions control system that will be displayed at the Faurecia booth is 2.3 kg lighter than the one found on the Renault Clio Energy TCe 90. In all, these three Faurecia innovations enabled Renault to reduce the vehicle's weight by nearly 30 kg, or 3 grams of CO2 per kilometre. "Tall & Narrow", two words that best describe the innovative, highly effective design of the tyres developed specifically for the Renault prototype. 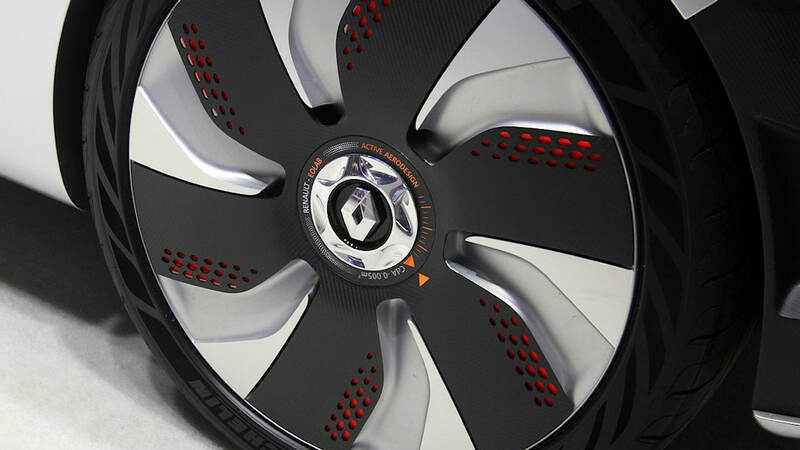 Michelin's engineers have designed a tyre in the entirely new 145/70 R 17 size, specifically for the Renault prototype, a model that seeks to deliver superior aerodynamics and energy efficiency. A narrow tyre with a long diameter simultaneously improves performance in several areas. Efficiency, first of all, thanks to the tyre's lower rolling resistance and better aerodynamics. Aquaplaning resistance due to the more pronounced bow effect created by narrow tires with a wide diameter. The bigger diameter also enhances comfort by more effectively absorbing irregularities in the road surface. In addition, the tire's narrower, longer contact patch reduces noise. The tyre's unusual size contributes to the overall styling of the prototype, whose sporty profile and performance features are accentuated by the new tire markings, using Michelin Premium Touch technology to give the markings and tyre design a striking, velvet appearance while at the same time reducing the tyre's aerodynamic drag. To meet increasing requirements in regard of safety, comfort and networking the Electric Parking Brake (EPB) is progressively replacing the mechanical hand brakes. In addition to the improved safety and comfort for the customers it offers the car manufacturers more freedom and options for the vehicle interior design. The Electric Parking Brake (EPB) in general replaces the mechanical activation via the hand brake lever by an electrical switch and electromechanical actuators building up the required clamp forces. To cover the huge variety of vehicle types, international automotive supplier Continental offers different EPB system solutions for different rear axle brake configurations. This refers in particular to the service brake on the rear axle, into which the EPB is integrated. The electric parking brake for drum brakes is an industry's mainstream product within the portfolio of EPB solutions being developed by Continental. It is a solution for vehicles equipped with drum brakes on the rear axle. The drum brake works via the 'simplex' principle. The electrical operation is controlled via an electronic system integrated into the Electronic Stability Control (ESC) system. The electric parking brake for drum brakes is tailored especially to smaller vehicles (A/B-class vehicles), which to date have been equipped only with a mechanical parking brake that is integrated into the existing drum brake on the rear axle. The system consists of two drum brakes with integrated electrical actuators and an electronic system that is integrated into the ESC and has the EPB specific operation software according to German Association of the Automotive Industry (VDA) recommendation 305-100. The MK C1, a vacuum-less compact brake system from international automotive supplier Continental, combines the brake actuation, the brake booster and the control systems (ABS, ESC) into a compact, weight-saving braking unit (up to 4 kg less than a conventional braking system) and therefore reducing the installation efforts due to its one box design. The electro-hydraulic MK C1 can build up braking pressure significantly faster than conventional hydraulic systems, thereby fulfilling the increased pressure dynamics requirements for new advanced driver assistance systems in order to prevent accidents and protect pedestrians. In addition, the system can fulfill the requirements for a regenerative braking system without any additional measures, while providing a high level of comfort. The main reasons for developing the new brake were the reduction in weight and installation effort, as well as in fuel consumption and CO2 emissions (e.g. support of zero drag calipers). At the same time, pressure dynamics for new Euro NCAP requirements (reduction in stopping distances with brake assist systems) and comfort (low-noise brake actuation is important for quiet electric vehicles) are enhanced. With the MK C1, Continental has developed a brake system that can fully cover 'mixed platforms' (standard, hybrid and electric vehicles) without compromising on recuperation ability. It provides good regenerative efficiency due to a brake-by-wire approach and meets also the highest Noise, Vibration, Harshness (NVH) requirements. The integration of the control function of the electric parking brake according to VDA recommendation 305-100 is also possible. Besides weight optimization and reducing the stopping distance, also the pedal feel is an important topic. The pressure in the simulator chamber of the MK C1 is hydraulically independent of the level of force on the wheel brakes, adjusted by a highly dynamic electric motor. The driver does not notice any difference in pedal pressure if the ESC or the ABS intervenes because they are decoupled from the pedal. In contrast to existing conventional brake systems, it produces better control over the pedal feel. The characteristics of the pedal feel (curve) of the MK C1 are adaptable to a specific desired pedal effort/travel. The driver can choose "sport" or "comfort" mode and/or the driving situation can also influence vehicle deceleration through software parameters. As one of the world's leading suppliers of hydraulic brake systems, Continental is constantly working on developing new and continuously improved solutions for traditional brake technology. For years the international automotive supplier enjoyed extremely good success with FN brake calipers. Through consistent further development, constantly improved braking performance besides reducing space requirements and weight were achieved. Continental's FN calipers offer additional positive features concerning their corrosion resistance. Furthermore, the weight can be significantly reduced by the use of aluminum. Continental remains true to the strategy to developing high-tech solutions at affordable prices. The cost-optimized FN-L calipers from Continental are ideal for expanding markets such as Asia and Latin America, for example, and especially for the use in affordable cars. The FNL48 Compact is an example of the development of an optimized brake caliper in terms of weight and residual torque, which contributes to increased fuel efficiency and thus a reduction in CO2 emissions. The brake caliper made from nodular iron in the one-piston design has been developed for use on front wheel brakes. It has an optimized seal groove, which reduces the residual torque to a minimum. By doubling the lifespan of the friction material, the pad thickness could be reduced by around half to seven millimeters. In addition, a plastic piston was used instead of a steel brake piston. The implemented measures led to a reduced weight compared to conventional brake calipers of approx. 400 grams per brake caliper. The FNL48 Compact is particularly suitable for vehicles in the small car segment. POSCO, in order to achieve weight reduction of a car body, employed new advanced steel alloys such as TWIP(Twinning Induced Plasticity) and 2000HPF(Hot Press Forming/Hot Stamping), which show high strength and high formability, along with a magnesium alloy (AZ31B) sheets. First, TWIP steel has unique material properties; its total elongation reaches over 60%, while sustaining tensile strength over 980MPa. These superior mechanical properties allow TWIP steel to be optimum in producing deep drawing parts with high strength. In the EOLAB prototype, TWIP steel is applied to the A-Pillar Lower part and Sill Side Outer part for further weight reduction with same structural and crash performance. Second, 2000HPF steel has a tensile strength of 600MPa initially, but after heat treatment, it attains over 2GPa of strength. In other words, it can have both high formability and ultra high strength via heat treatment. This material was applied to Sill side inner of EOLAB to enhance crash performance as well as weight reduction. In this project, POSCO covered from die design to part stamping beyond material supply. Third, in the Demo car, there are two magnesium parts; Roof Outer and Dash Lower part. Magnesium is well known as the lighter material than steel and aluminum by 60% and 20%, respectively. For instance, the magnesium roof of EOLAB tips the scale at barely 4 kg. For the car body application of this material, beside the wide magnesium alloy sheets production, POSCO carried out formability evaluation, the warm stamping as well as development of surface treatment process customized for these sheets. As a result, in the EOLAB Project, Renault can come up with innovative lightweight solution for future car development through the innovative material solution including application technologies from POSCO.